As one age, the hair also tends to change. 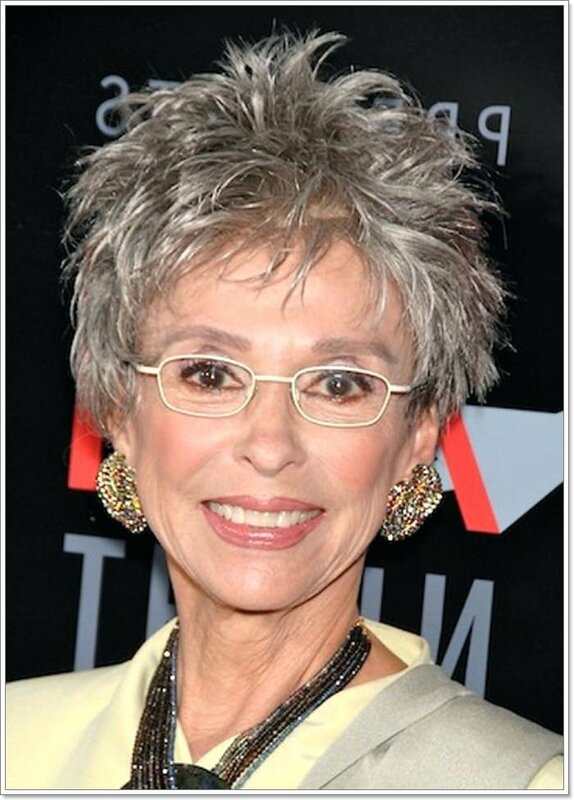 Finding ideal hairstyles for women over 60 can be quite inspiring to many who are advancing in age. 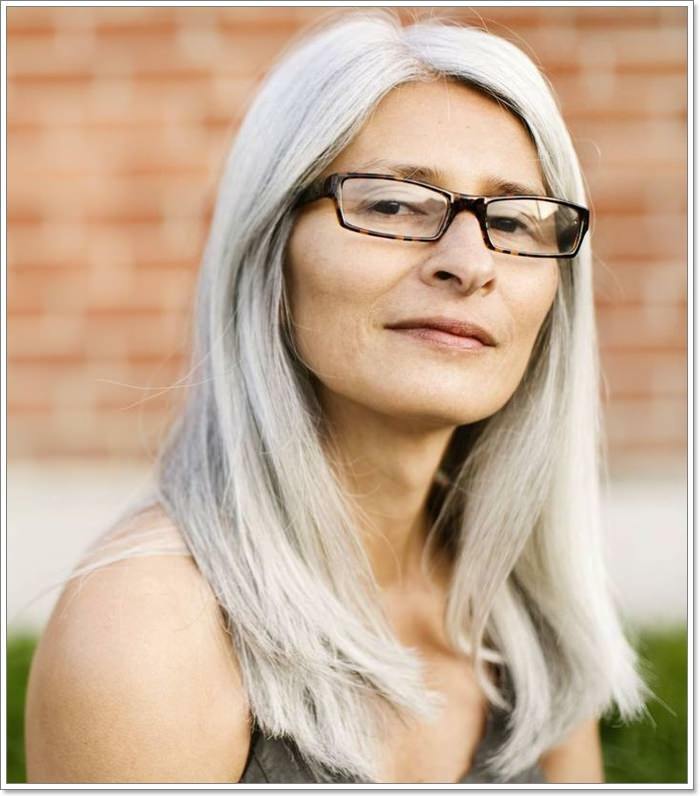 Many aging women prefer options that enable them to still look younger and also feel trendy. 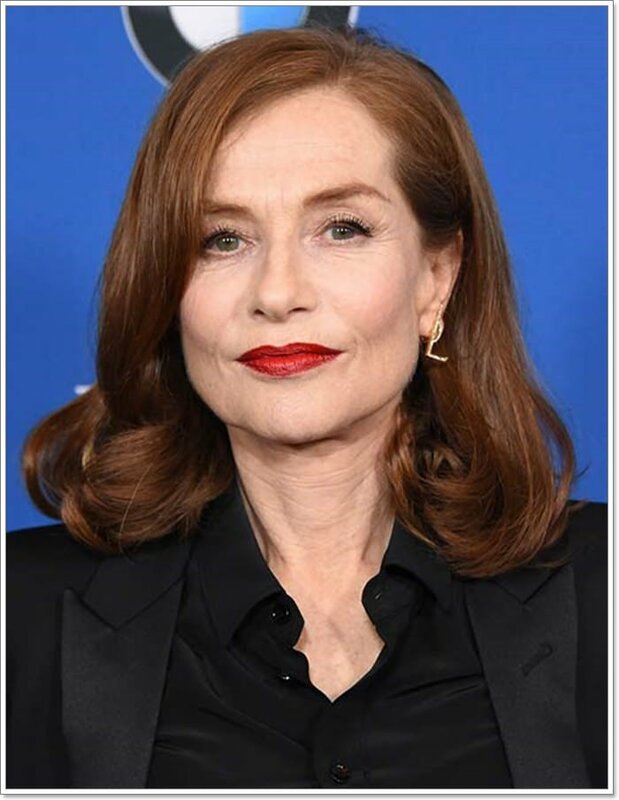 Age has truly become a number and with the versatile hairstyles, it can be hard determining one’s age by looking at their hair. 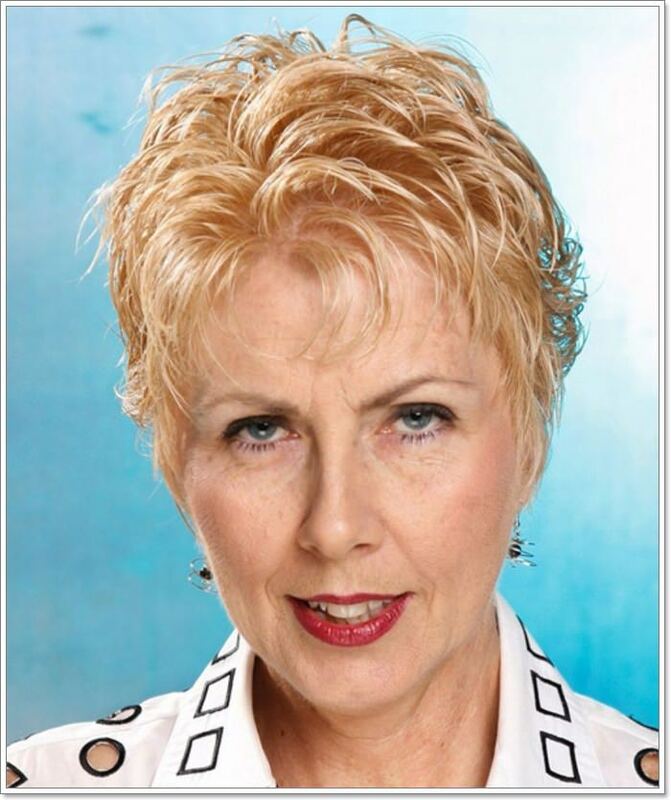 Before you visit your hair stylist, you should be armed with some cool hairstyles for women over 60 that you can try out. Whether you prefer adorning some hippie short hair or long hair, you will definitely find inspiring hairstyles that you can try out. To attain that flattering and younger look and feel, there are key elements that one should consider incorporating into their hairstyle. Color highlights can be used in a way that enhances the overall feel and outlook of the style. The choice of color doesn’t have to be bold for it to look flattering, one can still achieve an adorable outlook with warm trendy colors. Haircuts can also be super cute and work well when done by an expert stylist. 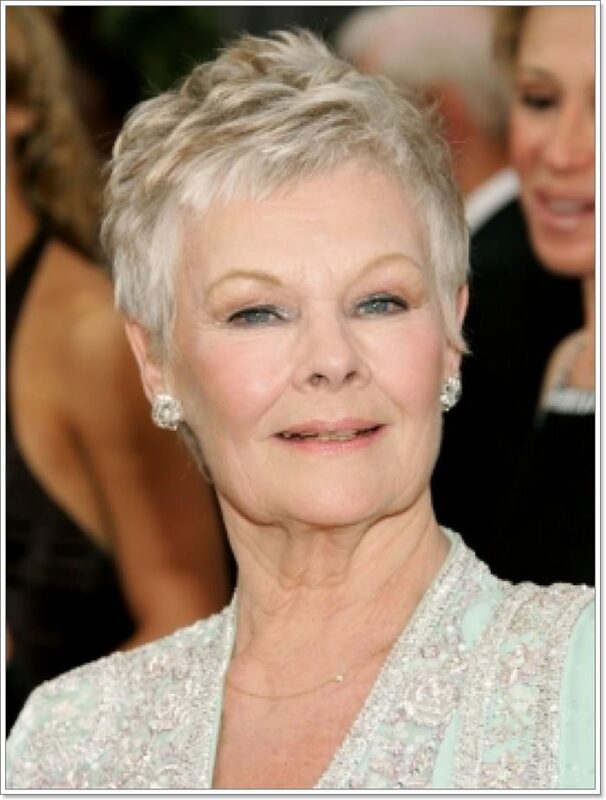 Take your time and sample some of the adorable hairstyles for women over 60. This hip and a stylish cut is such an adorable hairstyle that literally chops off a few years off your face. The cut is available in diverse styles and its ideal to let your stylist know what your preference is like. 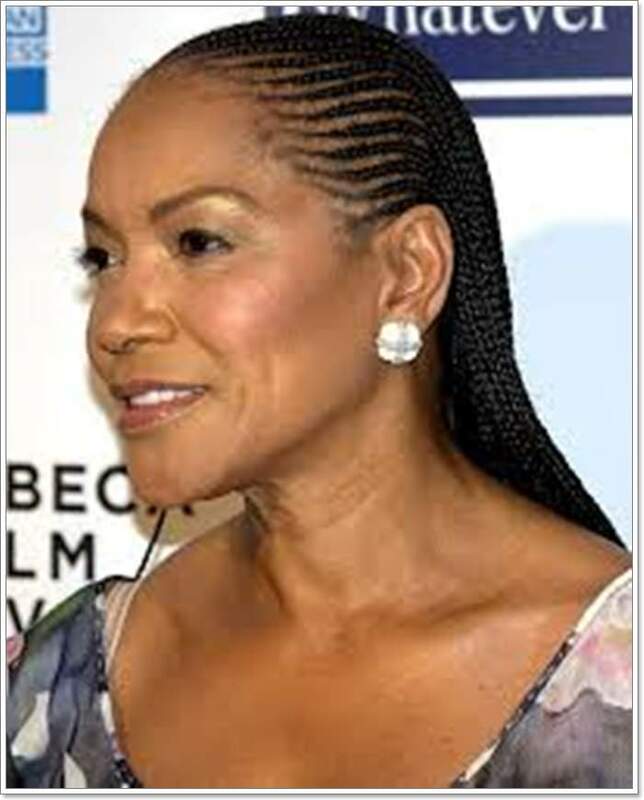 If you find this hairstyle to be inspiring then you should also consider if it blends well with your facial structure. The ash blonde color of the hair looks gorgeous and also brings out that magical outlook that enhances a younger feel and look. A hippie pixie style that enhances the facial features of the wearer. 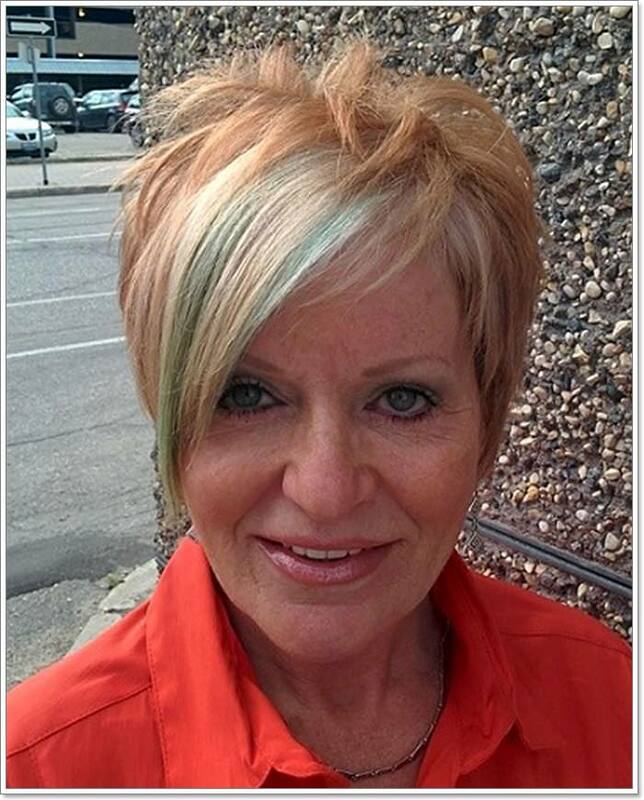 A beautiful cut and some style can bring tremendous transformation on an individual’s outlook. A light makeup like the one below completes the overall outlook into such a magnificent one. 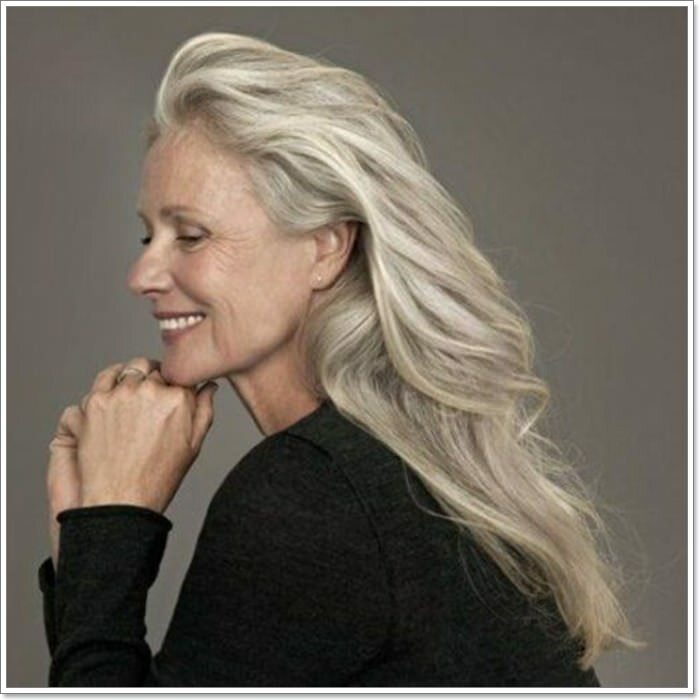 The wavy layers of the cut and the beautiful blend of dark and white hair bring out such a magnificent outlook. As one advances in age, they also get to evaluate everything about their style including hairstyle. Finding a hairstyle that makes one to feel beautiful ye comfortable can go along way in reinforcing one’s confidence in self. 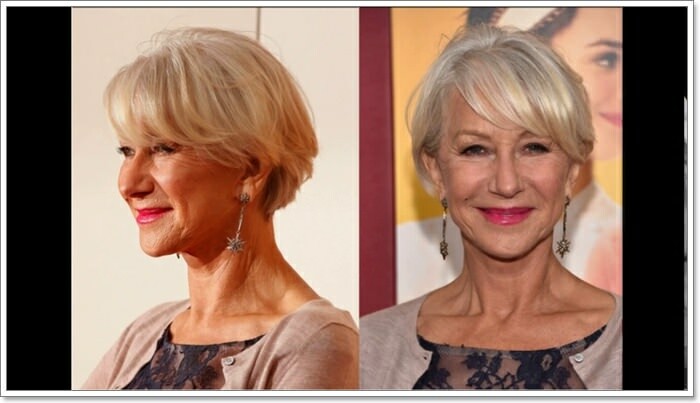 The rounded bob is such a trendy hairstyle that brings that younger look and feel. The rounded shape of the hairstyle frames the face beautifully and enhances that gorgeous smile by the wearer. Sporting well styled natural hair enhances once confidence and enables one to radiate such an appealing outlook. Times have advanced and what worked a few years ago may not actually work now. If you want to adorn some trendy hairstyle that’s suitable for your age then one should also be willing to change and explore other ideas. If you enjoy having very short hair then this is quite an inspiration. The short curly ends create a nice illusion of volume and enhance the wearer’s outlook. The blonde color shades used on the hairstyles also brings life and elegance to the style. As you settle for a hairstyle, ensure that you go for a style that reflects well with your facial structure and skin tone. 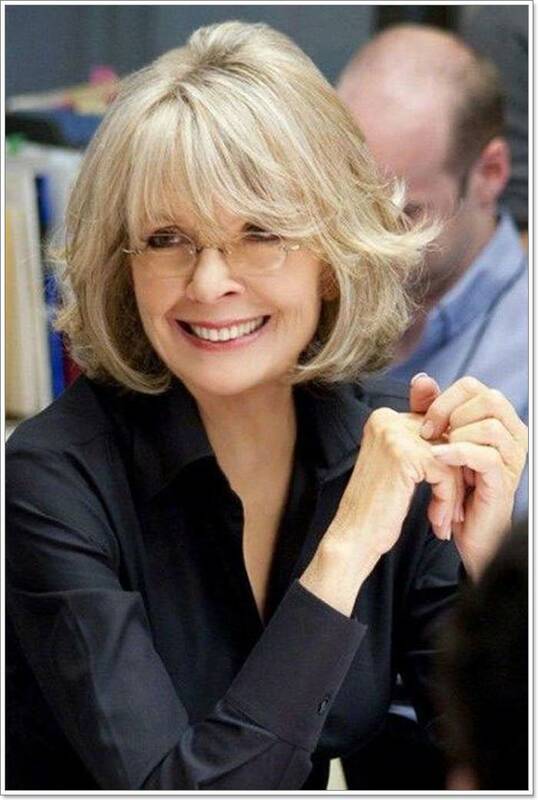 Applying some signature cut like the one below also helps with curving out that unique and adorable outlook. The ombre wavy layers in the hairstyle below look elegant with the blend of colors creating a magnificent contrast. From the sleek bang to the curvy layers each aspect in the style enhances the facial outlook and makes the hairstyle to stand out. 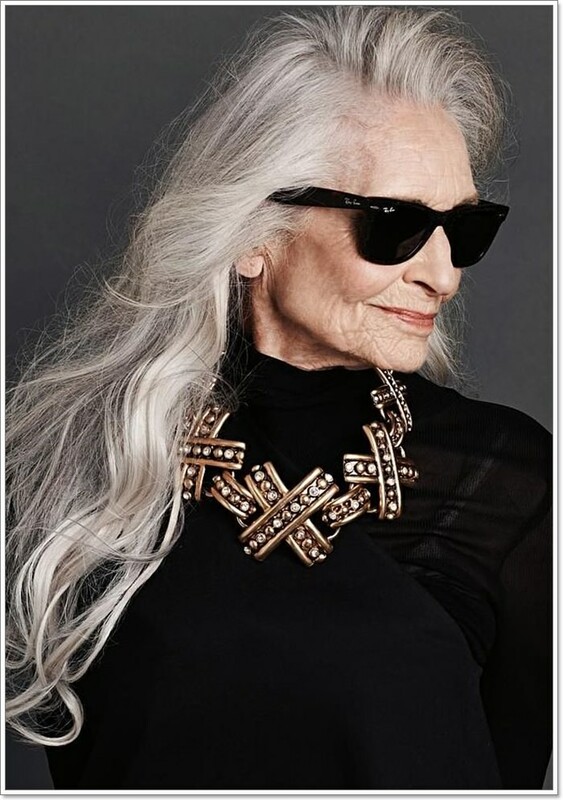 The style clearly shows that older ladies can equally rock the style with confidence for a classy outlook. 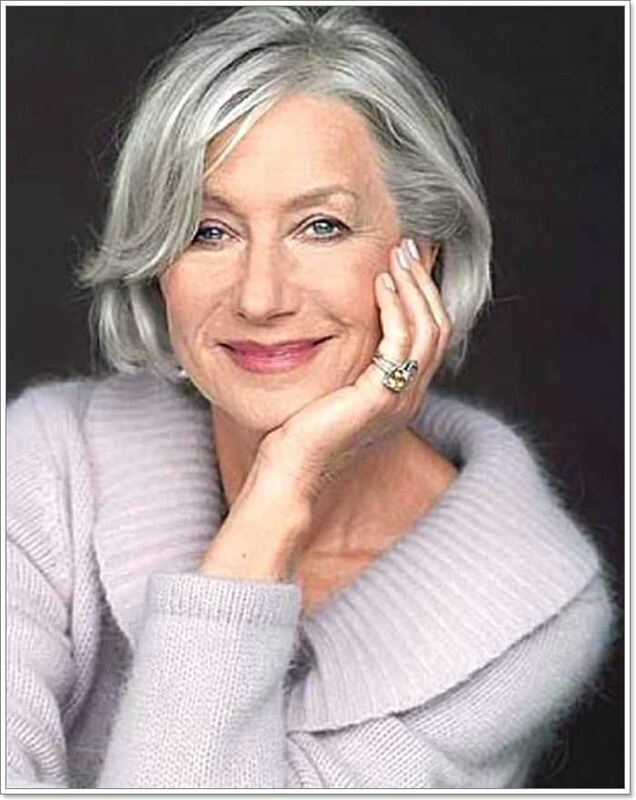 Regardless of the length of the hair and color choice, there are styles that work quite well for women over 60. A flawless look with bangs enhancing that chic outlook. 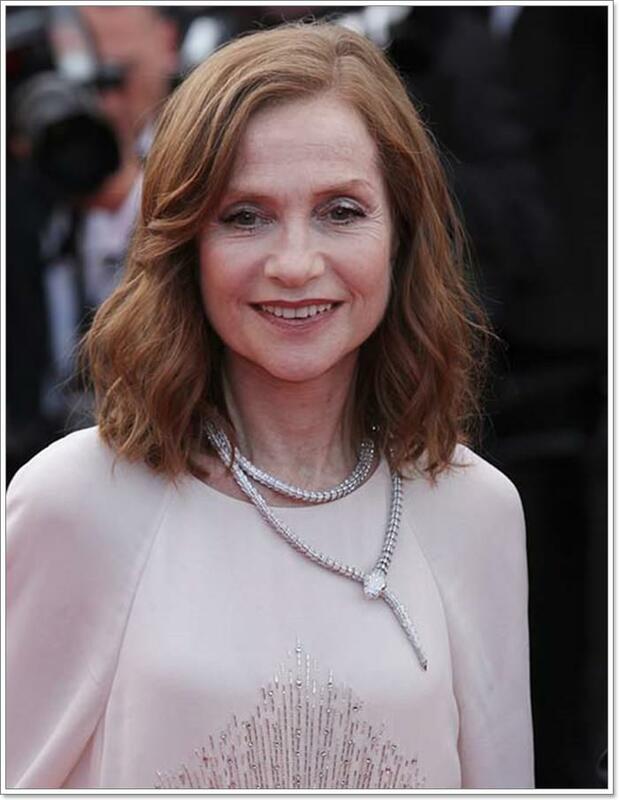 The straightened hair frames the facial features beautifully and makes the hairstyle to stand out. The below hairstyle looks classy and does not require a lot of maintenance. It also chops off several years of age from the wearer going by the outlook and the feeling waiting it ignites. A classic bob will always leave you with that magical look and can also be styled in a way that also enhances one’s personality. Shoulder length pixie is a chic and glamorous hairstyle that brings out that younger outlook of the wearer. The combination of blonde platinum and the dark layers of color brings out such a glamorous outlook. The beautifully layered streaks of hair create such a cool contrast that makes the hairstyle to stand out. If you prefer a style that leaves your hair feeling high and voluminous then this beautifully layered hairstyle is quite ideal. Styling short hair is much easier and has a way of bringing out that younger outlook and feel. The hip bob looks adorable with the bang and enhances the cool facial features of the wearer. Color combination is another magnificent aspect of this adorable hairstyle. The bright blonde adds to the beauty and intricacy of the style. If you are more into a simple and trendy outlook then you can consider recreating the style below. If you love adorning some voluminous and glossy outlook then consider adding waves to the style. The long hairstyle below looks adorable with the wavy layers making the entire style to stand out. The hair looks fuller and enhances the facial features of the wearer beautifully. 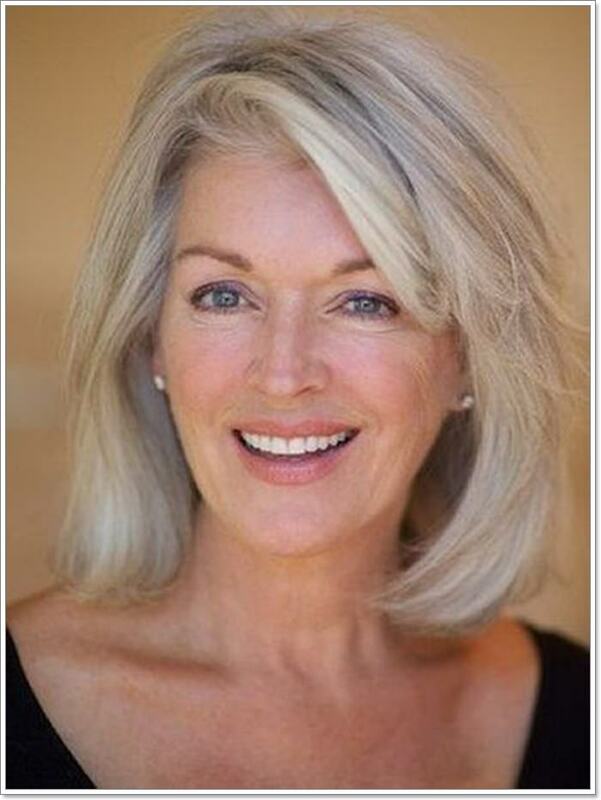 Ensure that you settle for a style that reflects your facial features beautifully. Such a humongous hairstyle that brings out a beautiful sassy outlook of the wearer. The underlying dark color blends well with the beautiful layers of pinkish blonde and creates such a nice contrast. From the curved edges to the bang, each aspect of the hairstyle brings out an appealing outlook. 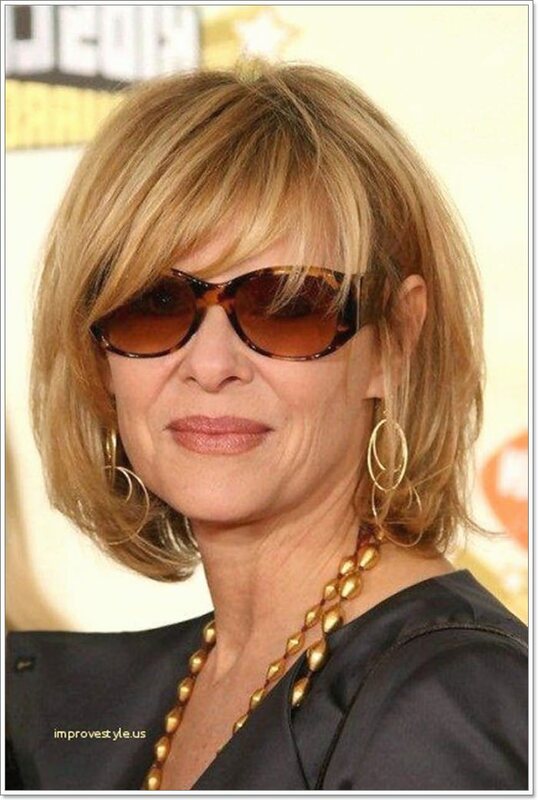 The blunt bob with side swept and curly layers is another adorable hairstyle that works well for the over 6o. The streaks of platinum blonde and the brown-blonde layers create a beautiful mix and add to the intricacy of the style. The nicely cut hair frames the facial structure beautifully and brings out such an intricate outlook. 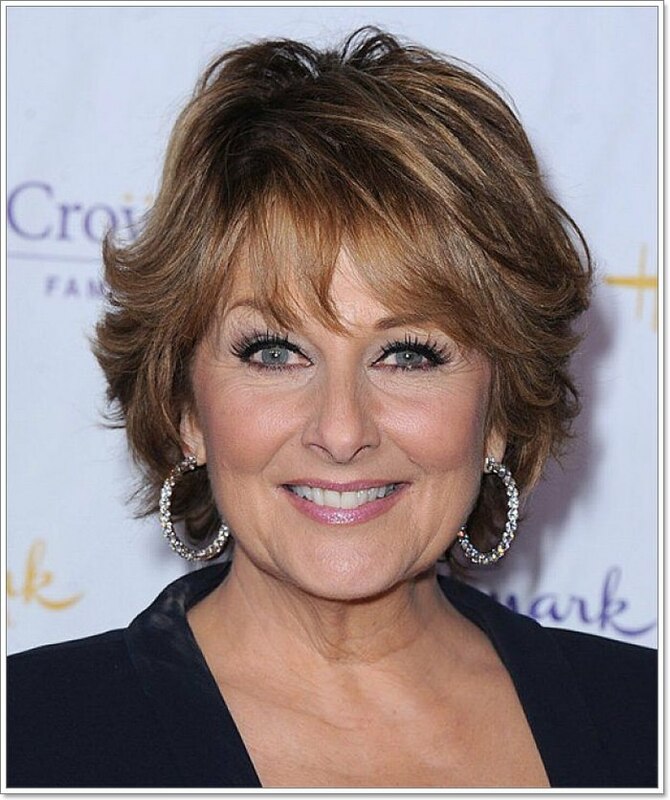 Hairstyles for women over 60 don’t have to be boring and short, there are classy styles that one can take advantage off for a cool outlook. 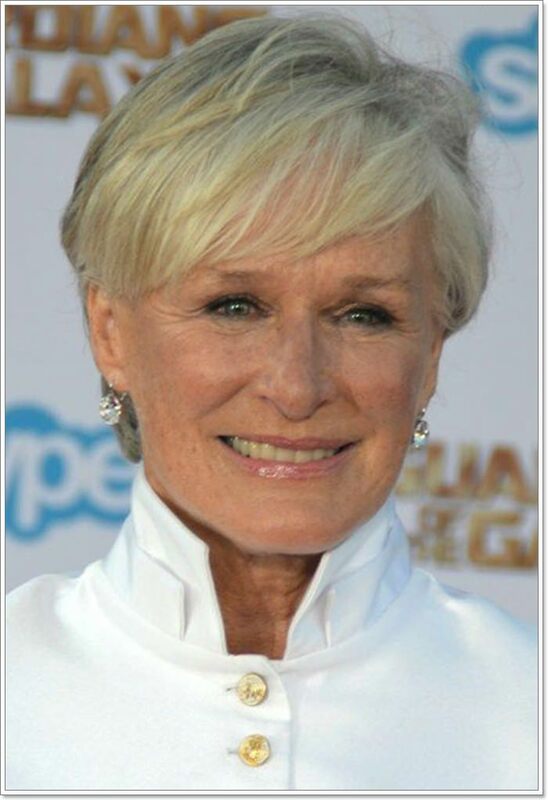 The short spiky hairstyle looks adorable and enhances the facial features of the wearer so beautifully. The makeup and the color highlights used in the hairstyle has a way of bringing out that younger feel and look. 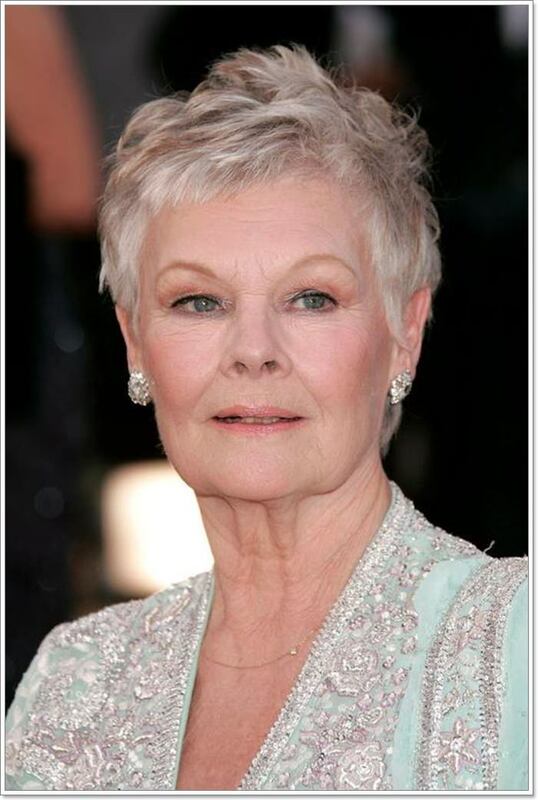 For women over 60, they are not likely to be influenced by trends and other popular hairstyles. A lot of factors go into when choosing a style that suits them well. Regardless of the length of the hair and style preference, there are fabulous styles that can have a significant impact on one’s overall outlook. The combination of golden blonde and platinum expresses and expertly blended hue that’s quite visually appealing. The wavy layers looks nicely done and with the color shades expressing a nice contrast. Layers have a way of adding some air of youth to a hairstyle and the beautifully textured and layers in the style below is quite captivating. Nothing brings that youthful outlook like the flirty feed in braids. The braids look trendy and skillfully fixed with the hanging layers enhancing the overall outlook of the style. The sweet and sassy styling brings out that younger look and also enhances the facial features of the wearer in such a beautiful way. The silver sheen shades make the entire style to pop in such a beautiful way and creates a cute asymmetrical outlook. The sleek and layered nature of the style is not only outstanding but also reflects well on the wearer’s skin tone. There is no better way of adding dimension to your hairstyle unlike incorporating your preferred. Apart from making the hairstyle to stand out, it also brings some life and elegance to the style and that brings out such a younger look and feel. Layered pixie for short hair is an ultimate gorgeous outlook that nicely suits those with short hair. A little bit color adds contrast and dimension to the hairstyle in a way that makes it stand out. If you have that beautiful thick hair then you can try out this adorable hairstyle for an outstanding outlook. The combination of platinum blonde and the underlying dark layers brings out some adorable outlook. Choppie pixie for the thick hair looks stunning with the blend of colorful hues making an adorable outlook. 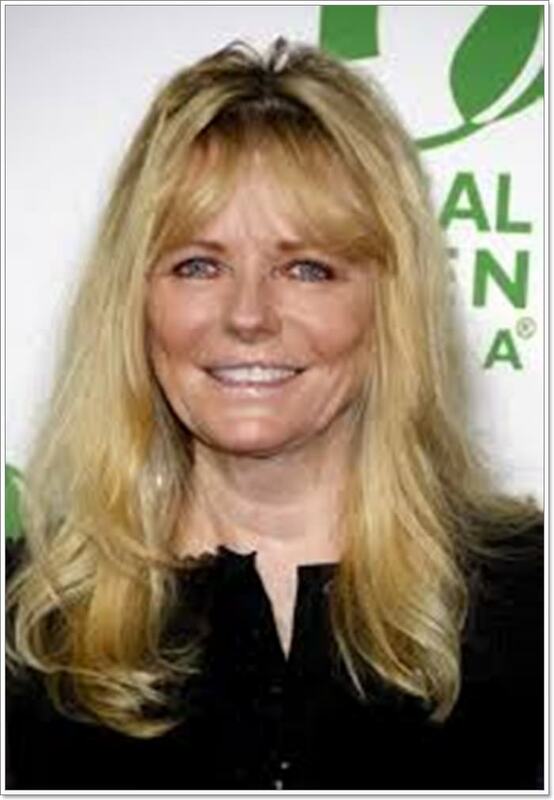 From the beautiful bangs to the wavy layers of the hairstyle enhances that younger look and feel. This hairstyle works well for both thick and thin hair and all you have to do is to settle for a stylist that can bring out the wavy layers beautifully. 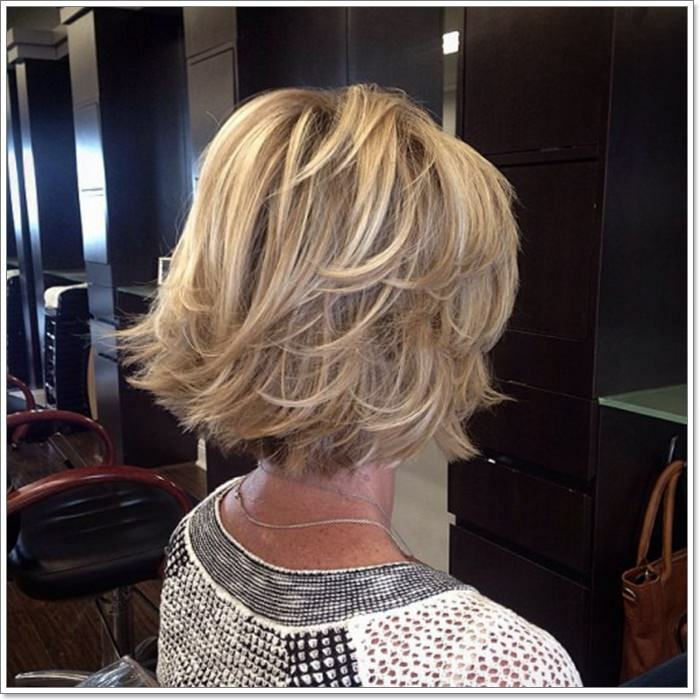 The short layered hair with blonde balayage shades makes the entire hairstyle to stand out. The beautifully blended layers of hair look voluminous and bring out such a gorgeous outlook. The hairstyle frames the facial structure beautifully and makes the entire style to stand out in such a cool and magnificent way. The long layers adds volume and intricacy to the style. If you are into something that’s simple then this hairstyle is quite ideal. 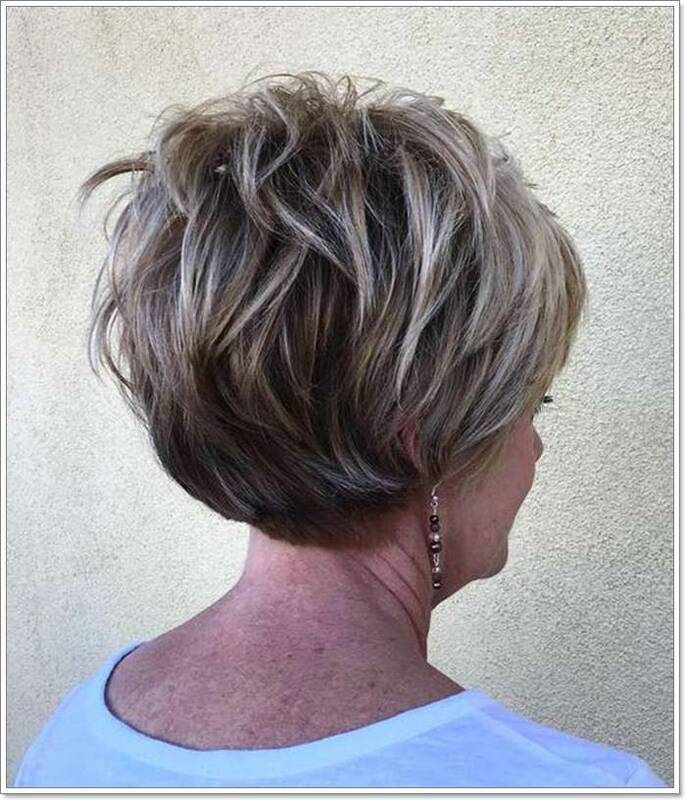 Short pixie with inverted layers is such a cool and gorgeous hairstyle. 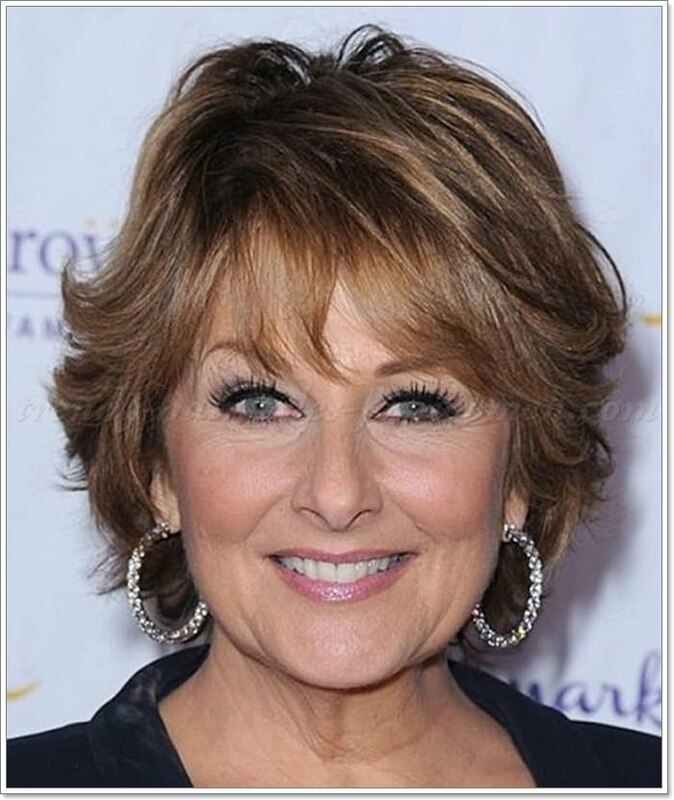 If you are looking for a perfect cut that brings out that younger and adorable look then consider the below hairstyle. The delicate layers bring out a sassy and simple to manage hairstyle with the blend of color shades creating a beautiful contrast. Before you settle for any cool hairstyle, ensure that it works well with your hair texture and the facial structure. Achieve this cool asymmetrical outlook with beautifully layered hair. The bold silver blonde looks adorable and brings life to the hairstyle. The layered and straightened hairstyle creates a cool outlook and also enhances the illusion of volume. From the beautifully framed facial structure to the bold color shades used, every aspect of the hairstyle makes it pop in such an adorable way. Pump up your strands of hair with cool bangs and flicked out layers. The long wavy layers bring dimension to the hairstyle and make the entire style to stand out. The underlying black shades blend quite well with the golden blonde strands and create an adorable contrast. If you are into a style that brings out that increased dose of confident then you can opt for the hairstyle below. 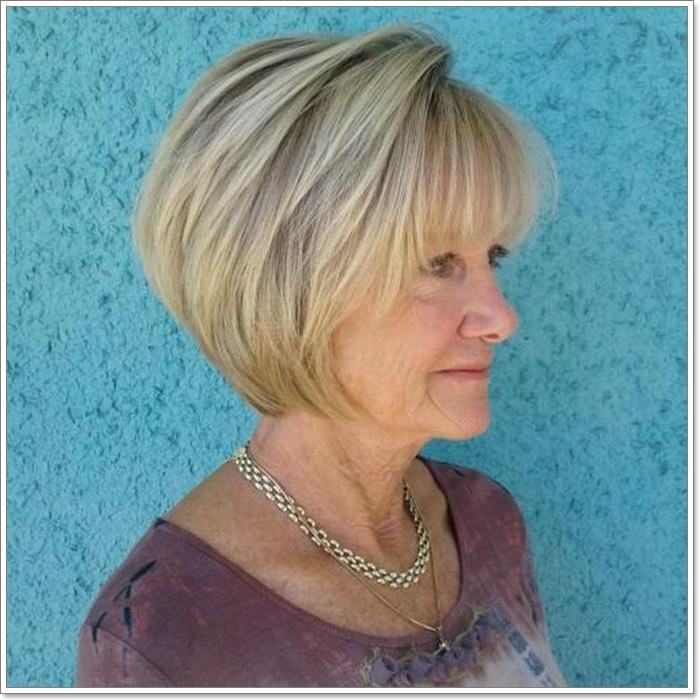 Curvy layered edges with a sleek bang is another cool way of styling hair that works for women over 60. Apart from showing off the beautiful face, the wavy layered hairstyle looks amazing with the color highlights showing a nice contrast. An ideal hairstyle is that which don’t change your overall outlook but instead enhances it. A wavy and voluminous hairstyle that captures the facial structure and beautifully enhances the overall outlook. The simple bang draws focus to the beautiful eyes and also highlights the enhanced voluminous outlook. The wavy layers around the crown lift it beautifully and also gives the hairstyle volume. Curled layers of hair around the front area does not only highlight the facial features but also removes hair off the face. 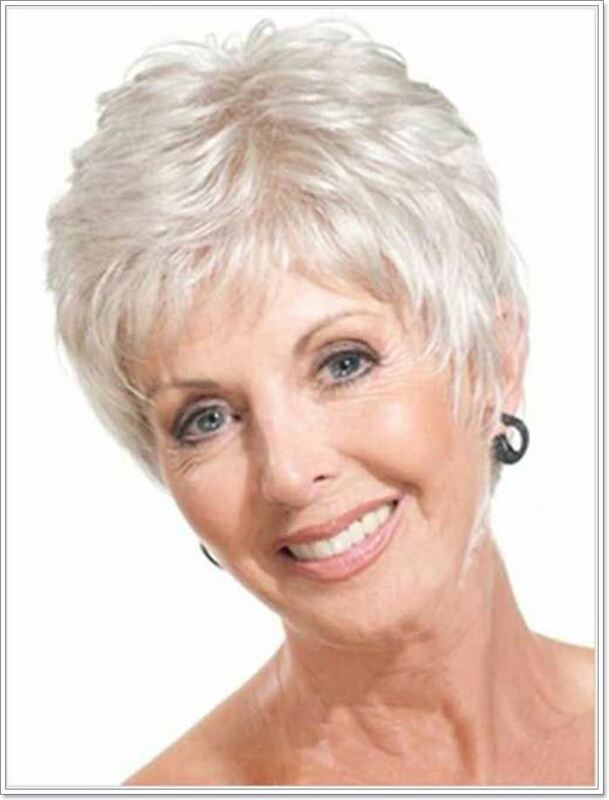 Short hairstyles for women over 60 years can be quite versatile and provides one with inspiring options to choose from. The stacked layers of hair liven the style and also adds to the intricacy of the hairstyle. The aspect of color is another key element that makes the entire hairstyle to pop in such an adorable way. If you want to add depth to your hairdo then opt for color highlights that bring out the best of your hairstyle. The curly layers add depth and volume to the thin hair which also gives the hairstyle dimension. Color can really do wonders for short hair and has the potential of making the hairstyle to stand out in such a fascinating way. The hairstyle is nicely cut and the curls make every aspect of styling to stand out. It also frames the facial structure beautifully which makes the hairstyle to glow. The sleek and sassy pixie looks adorable and makes the hairstyle to stand out in such a magical way. 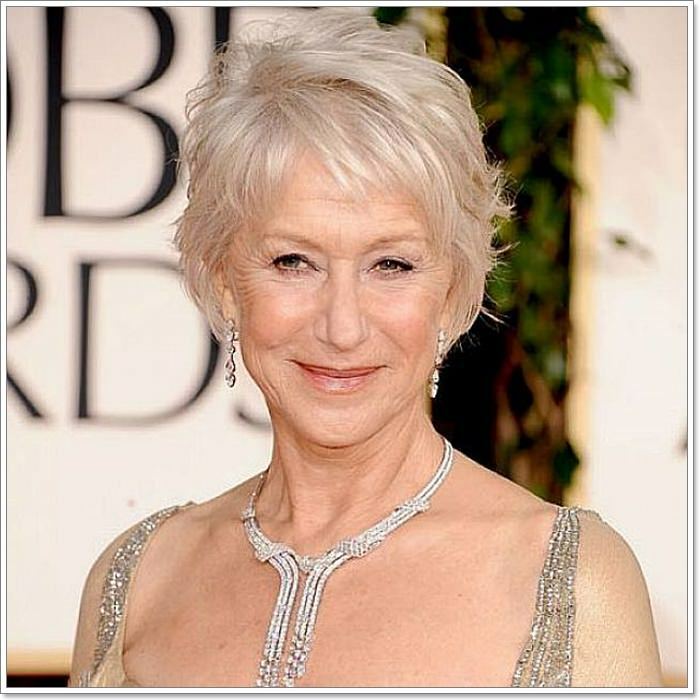 The bright silver blonde color used is fabulous and brings life and elegance to the hairstyle. 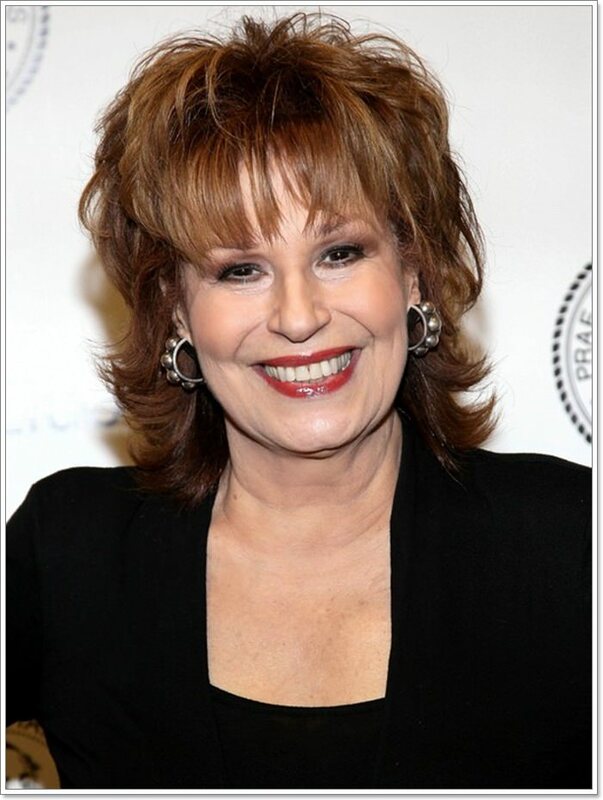 Light curl bob is a great way to style your hair as it brings out that younger outlook and feel. The layered curl also frames the facial structure beautifully and in turn, brings out that adorable and fabulous outlook. 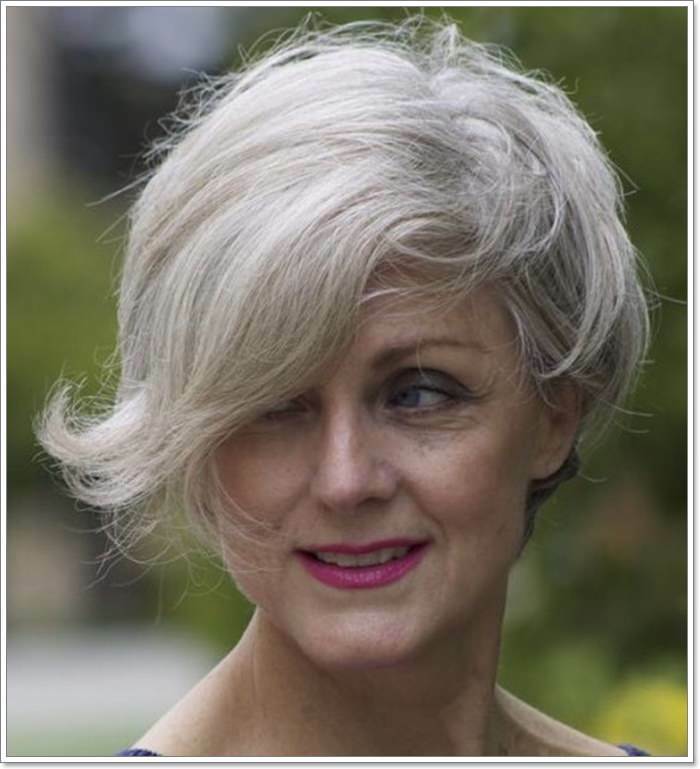 Styling short hairstyles for women over 60 begins with creative ways of using color. A good choice of color can do wonders on any hair and has the potential of enhancing one’s overall outlook. The underlying dark color used in the hairstyle blends well with the golden blonde color and creates such an adorable contrast. The wavy layers also enhance volume and give the hairstyle such a cool dimension. The lovely way in which the cut layers frames the facial structure makes the style to really stand out. Super silver highlights used in the below hairstyle makes it pop in such a fascinating way. The subtle combination of brown highlights creates a cool blend and enhances the overall outlook of the style. Short hair can be such a head turner especially if the color used blends well with the skin tone. The straightening of the wavy hairstyle backward also removes loose hair off the face and that enhances the simplicity of the style. The side swept curvy style looks spectacular and also enhances the facial features of the wearer. This is such a flattering style that looks great on women that are over 60. Apart from the aspect of color that makes the hairstyle to stand out, the wavy layers also make the hairstyle to stand out in such an adorable way. The combination of platinum blonde with the silver shades makes the hairstyle to stand out with the underlying dark shades bringing out that cool outlook. 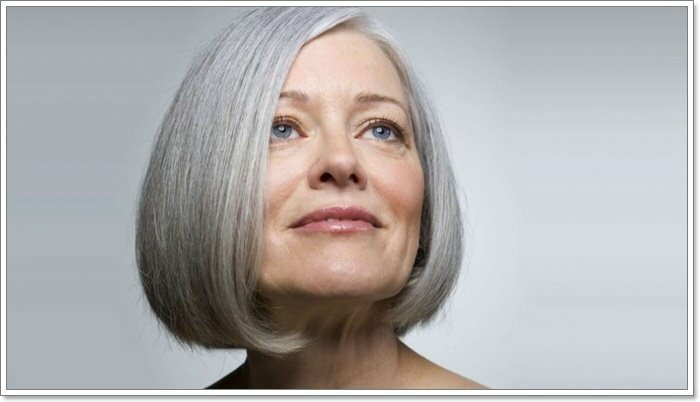 Before you settle for any hairstyle, here are some of the tips that work well for women over 60. Hair tends to change over the years with some becoming thinner as the years advance. There are styles that may look better for thinner hair and those that are great for thick hair. Ensure that you settle for a hairstyle that works well for your hair type. Color has a way of adding glam and life to your hairstyle. Despite your age, never shy away from using color as you never know the impact it can have on your overall outlook and feel. In most cases, color if well used has a way of enhancing the visual appeal of the hairstyle and also reinforces ones feeling of confidence. As much as many older women tend to shy away from wearing bold bright colors, there is no actual reason for not trying them out. 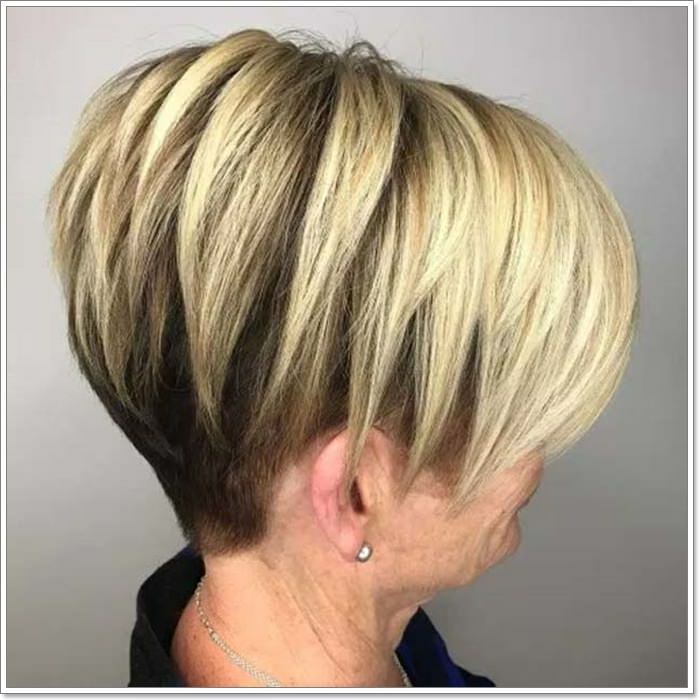 If you are on the lookout for hairstyles for women over 60 that can bring out the best of your styling and also enhance your outlook then you should be ready to embrace change. Be open to change and more willing to explore hairstyle ideas that work well with your hair. If you have thin hair and desire for a more voluminous hair then you can also consider using hair extensions. There is a wide range of hair extensions in the market that you can choose from. To maintain your preferred look once you have styled your hair, you need to consult with your stylist once in a while for better ways that you can use to maintain your hair. A good stylist can help you with styling ideas and options that you can use to enhance the outlook of your style. The hairstyle below looks amazing with the use of platinum highlights enhancing the overall outlook of the style. Once you have styled your hair, consider having styling options that you can use for different occasions as desired. This blend of black and blonde shades is amazingly gorgeous and reflects beautifully on the wearer’s skin tone. It takes a professional stylist to pull such an amazing outlook that enhances the beautiful face of the wearer in such a breathtaking way. The blend of platinum blonde shades and the dark layers brings out such an adorable outlook. The layered bob also has an eye-catching volume that makes the entire hairstyle to standout. 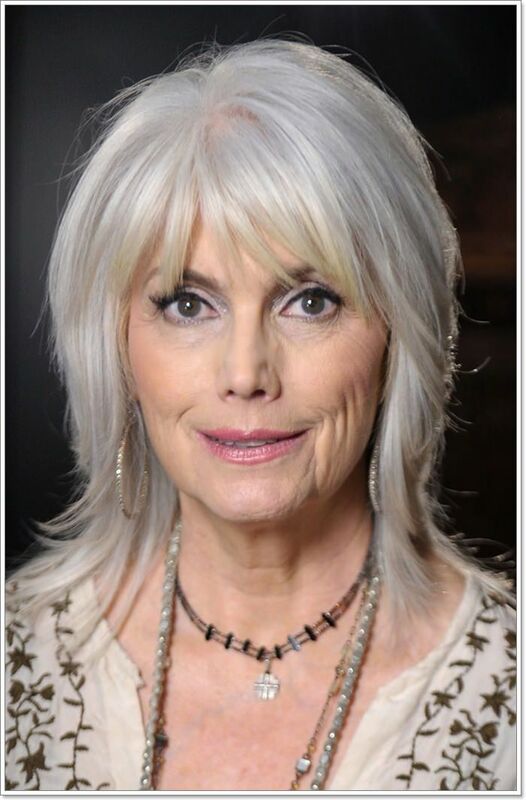 The side swept silver bangs looks spectacular and frames the facial structure in such a magnificent way. The voluminous nature of the hair is one aspect that makes it to really stand out in such an adorable way. To attain that glamorous outlook, use colors that blend well for a cool contrast. You can also use the lighter and more bright colors at the top and the darker ones underneath. 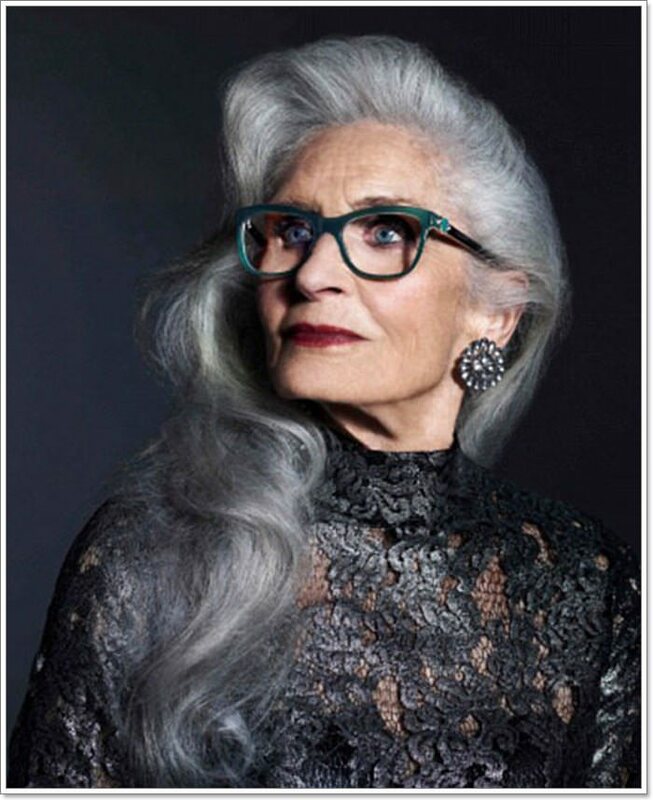 Such a combination has a way of bringing out that sassy outlook in a way that also chops off some of the years off the wearer’s age. The shoulder-length bang with layered waves looks spectacular and brings out that adorable outlook. Platinum white is another cool color that brings out that edgy outlook in a way the’s quite eye-catching. The bold color used with subtle golden shades creates a nice contrast. It also makes the entire hairstyle to stand out in such a magical way. Since natural hair gets to thin out as one age, it’s also ideal that one considers the use of hair extensions for a more voluminous outlook. 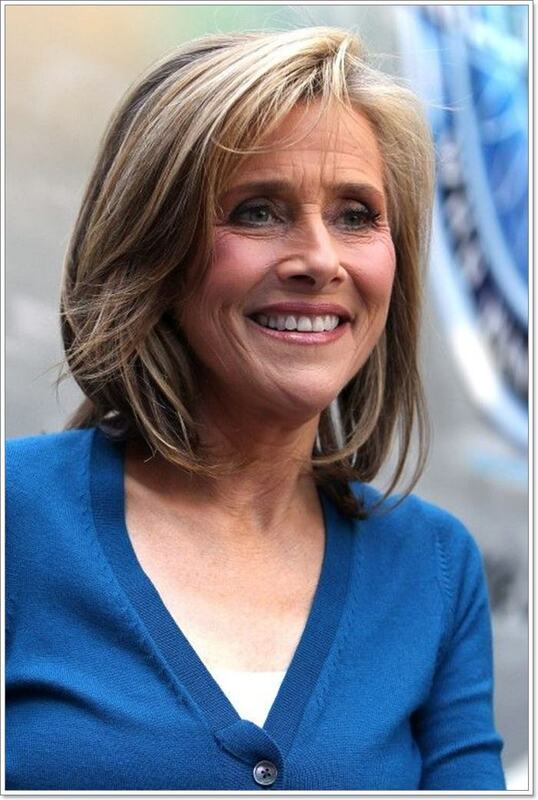 Brown hair color looks great on older women when combined with highlights. 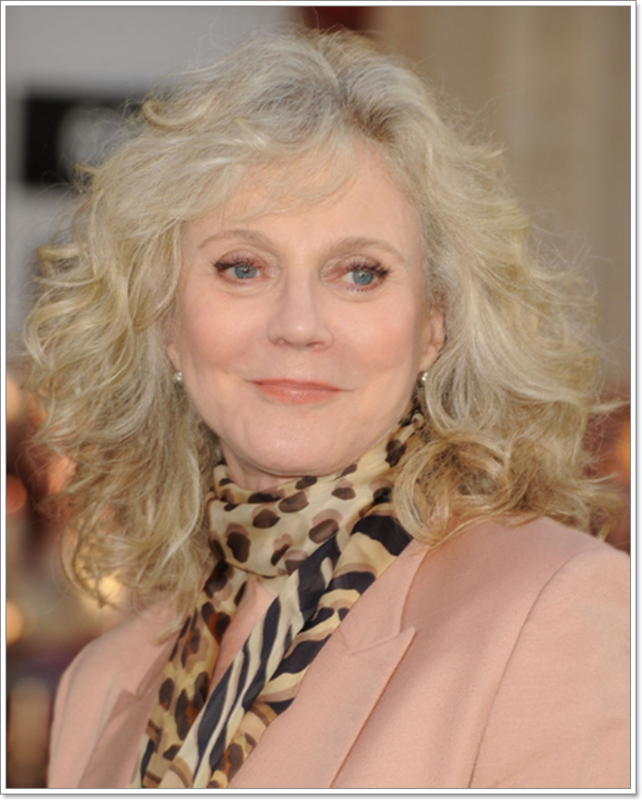 Hairstyles for women over 60 can be quite flattering when the aspect of coloring is combined with cutting. The highlights can be upgraded to colors that blend well and reflects beautifully on the wearer. The cute bob hairstyle below looks spectacular with each layer of the curls bring out such an outstanding outlook. The curly layers bring dimension to the style and frame the facial structure in such a beautiful way. The blend of brown-blonde and silver shades also adds a nice contrast to the hairstyle. The ash-grey balayage is a magnificent style that enhances the visual outlook of the hairstyle. The dark and silver layers of color combine quite well and bring out such a soothing outlook. The beautifully layered hairstyle looks voluminous and makes the style to stand out in such a cool way. If you want to keep a simple and neat hairstyle then consider settling for colors that reflect well on your skin tone and personality. 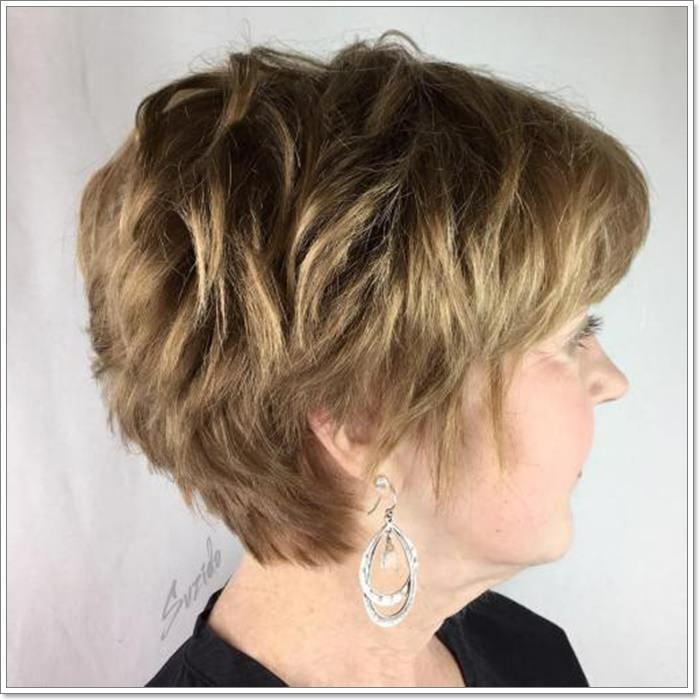 Highlighted short hair works well for women for women over 60 and has a way of enhancing the visual appeal of the hairstyle. The layered strands of hair with curled edges and a bang looks magnificent and also adds intricacy to the hairstyle. The underlying black color blends perfectly well with the blonde platinum layers. The styling is not only epic but also frames the facial structure beautifully. The cute bang enhances the beautiful face in such a cool way. The way layers of hair and the color blend and reflect beautifully is a pure work of an expert stylist. The layered wavy hair looks magnificent with the wavy edges also adding to the intricacy of the style. As much as the hairstyle may look simple, it takes some level of expertise to recreate it. 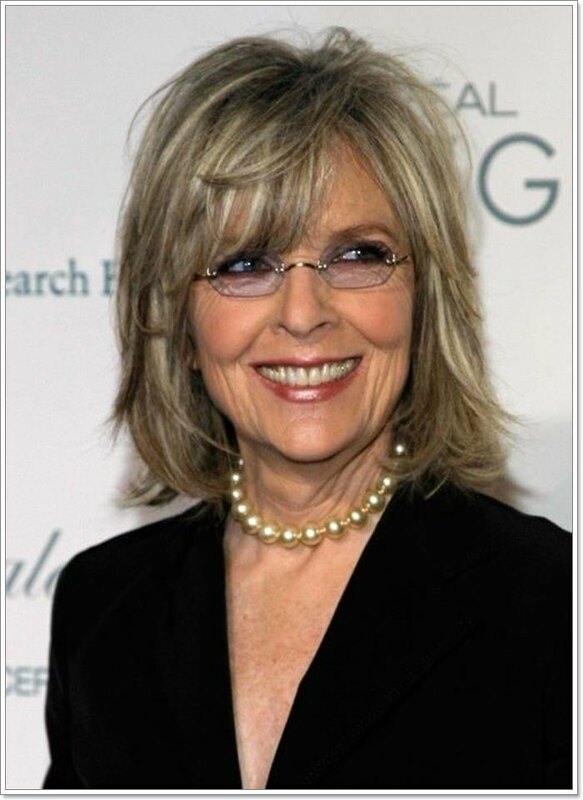 The shoulder length hairstyles frame the facial structure beautifully and reflect nicely on the wearer. 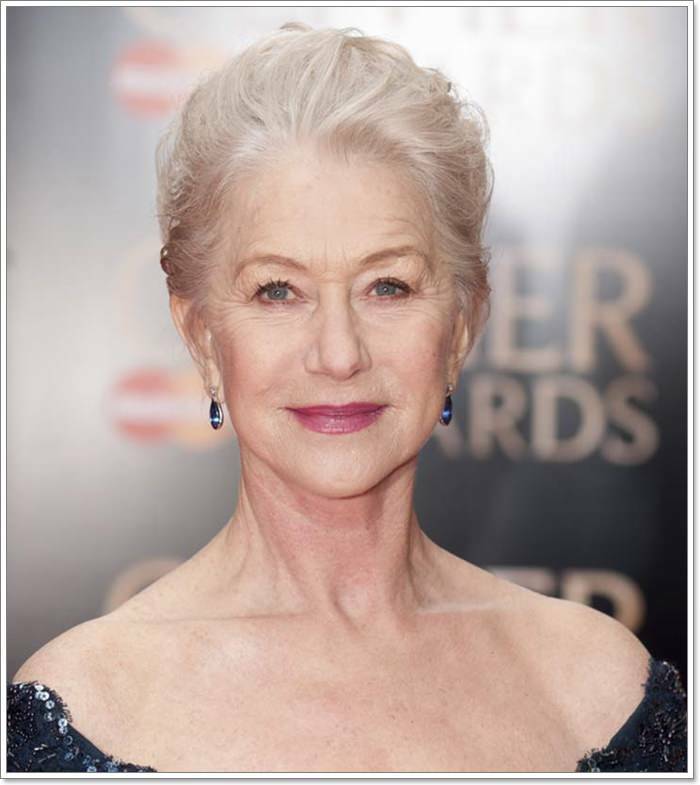 This is one hairstyle that works well for all age groups and enhances that younger look on women over 60. With short hair, it’s advisable that one works with a stylist capable of making the curls and waves to spring out in such an adorable way. The hairstyle below looks simple and easy to manage. The blend of two distinct colors makes the hairstyle to stand out in a way that looks magical. From the adorable cut to the simple bang and wavy layers, each element used in the hairstyle adds to its complexity and elegance. Your hairdo doesn’t have to shout for it to look appealing, you can opt for warm colors that blend well for a glamorous outlook. Another way of styling the hair is by having a cut. It may end up looking more fuller and classy if well styled. The hairstyle below looks simple and easy to manage with the blend of different shades of color making the hairstyle to stand out. You can spice the style up by adding some curly or wavy layers. If your hair is naturally curly then you can flaunt them so as to express that adorable outlook. The slightly raised wavy layer at the crown area gives the hairstyle dimension and the blend of colors also add contrast to the hairstyle. If you prefer a straight finish with a little bit of a bang then the below hairstyle is a perfect choice. The fact that you are no longer in your twenties or thirties doesn’t mean that you can’t rock some of these trendy styles. Bring life to your hairstyle by adding glam highlights and wavy layers to your style. The blend of dark and silver colors adds depth and dimension to the hairstyle and also create a beautiful contrast. 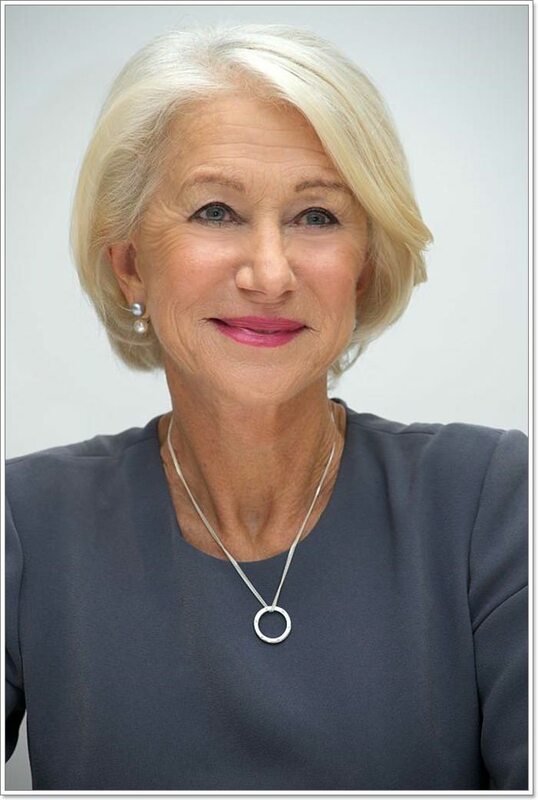 Even as you look out for some trendy hairstyles for women over 60, you should also be armed with some styling skills that you can make use of if your hairstyle is to last longer. Short and wavy haircuts are not only flattering but also has a way of enhancing the wearer’s outlook. The combination of platinum shades and the underlying dark layers of color makes the hairstyle to stand out. If you find this style to be inspiring then you can look out for inspiring options that can be used to style it. You can settle for the various types of bobs and either add curls, waves, color or whatever you find to be appealing.